The lush green city escape that is Lumpini Park sits on over 140 acres and is home to a variety of trees, plants and wildlife. First becoming a part of Bangkok in the 1920’s, it once was sitting on the city’s outskirts, but today it is centrally located and easily accessed by the BTS and MRT. 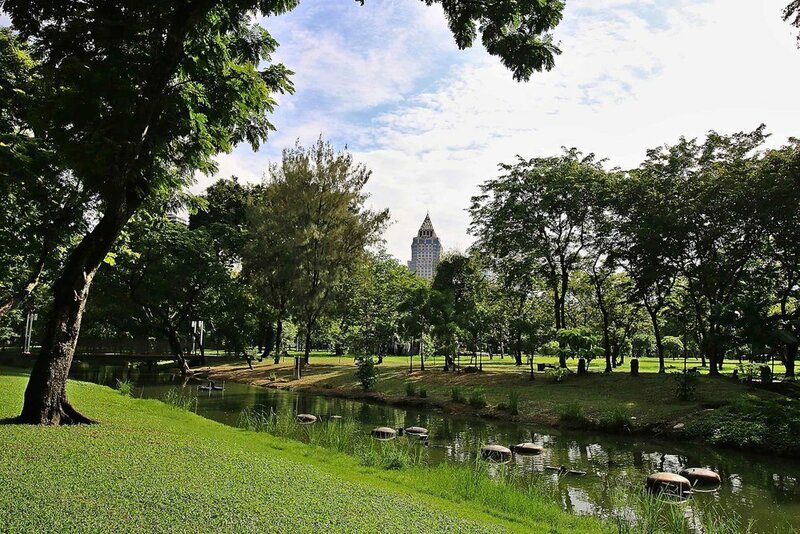 Just minutes from either MRT Lumpini or Silom and just 350 meters from BTS Sala Daeng, Lumpini Park offers visitors a variety of outdoor activities in a setting that you’d otherwise forget you were in a major metropolis if not for the towering sky scrapers of the business and tourist district it sits in. Entering the park from the main western gate, park dwellers are greeted with a statue of King Rama VI in recognition of the Thai King who established the park. Due to the immense foliage that provides a stunning contrast of perceived temperature from the blistering heat of the city streets and blazing sun, most visitors flock to the park for a healthy dose of fitness on the 2.5-kilometer track that runs a loop of the park. In the early morning and evening times, when the day is at its coolest temperatures, you can find Bangkok office workers, elderly residents, teens and tourists walking, jogging or cycling along the track. On the paths winding through the inner parts of the park you could find groups of aerobics aficionados working out to the sounds of local and international dance tracks. Making your way around the park’s paths will lead you to other areas that are catering to the health and fitness crowd. Lumpini Park boasts an outdoor free weights area complete with bench presses utilizing tractor trailer tires and a host of other outdated and weathered weights and equipment. Scattered around the area are also a heavy helping of calisthenics fitness machines. In addition to the variety of exercises opportunities, there are plenty of areas and activities to laze the mid-afternoon away. With an artificial lake in the center of the park, there is a chance for the romantics to take a slow spin on one of the paddle swan boats, or find a shady space on the grass under one of the large trees to enjoy a picnic. Anybody with an appetite while visiting the park would be pleased to know, as with most every area of Bangkok, there is delicious Thai street food being hawked. For those who anticipate enjoying their food inside the park please remember to not hand feed the Asian Water Monitor Lizards that you may spot gliding by in the waters or sauntering across the paths and grass. Besides the lizards, the park is also home to a variety of birds that many bird watchers wait to catch a glimpse of. Other birds are known to sing their mating songs providing another sense of being in a tropical forest. In addition to the song birds, Lumpini Park hosts concerts for families who come to listen to the soothing jazz sounds or the Bangkok Symphony Orchestra. 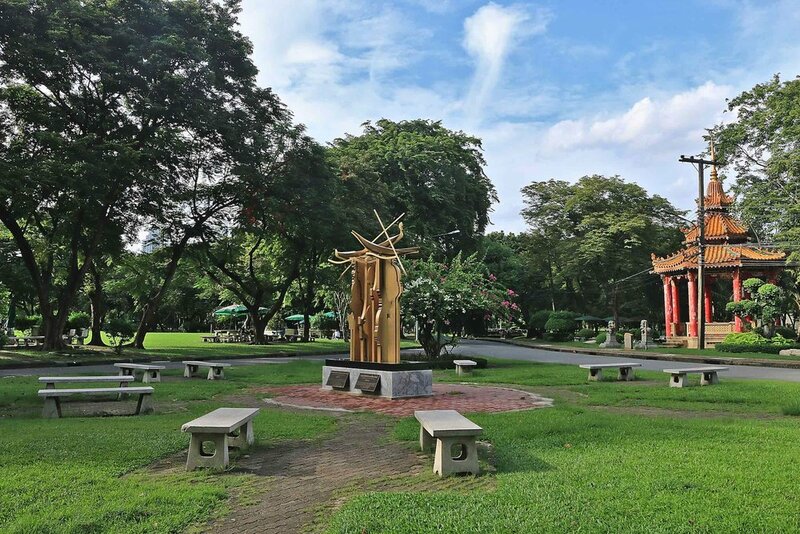 No matter what you may come to the park to do, it should be a treat to experience, especially as a well-deserved retreat from the heat of Bangkok.